Itinerary of a Polish painter of national repute, to escape the regime and its own success, moved to Paris where she lives for the restoration of paintings, while continuing its investigations pictorial. She resumed contact with his country after the fall of communism and relaunch a new career shortly before his death. Jadwiga, Arika Orlowska was born in 1928 in Warsaw from a landowner noble family. 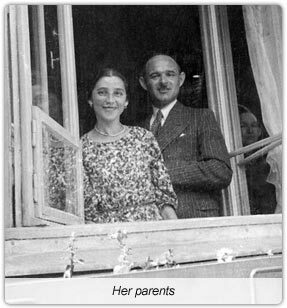 Her father, Wladyslaw Lubicz- Orlowski, agricultural engineer, during a mission in Russia just after the Revolution, brings back his young wife of Armenian origin Wartuga Unanianc, in the family property near Warsaw, where she gives birth to their two daughters, Alina and Arika. During the war, being an active member of A.K. (Army of the Interior, Movement for resistance that, during the second world war, fought against the Nazi but also against the Soviets) he has to leave his country to go to the United States of America right after the dissolution of this underground movement in 1945, so not to become a victim of the communist government. He dies in 1965 in Eugene, in the Oregon State, without having ever seen his family again..
After having miraculously escaped from the war horrors, the family is nevertheless despoiled of the totality of its inheritance, confiscated by the new politic regime. 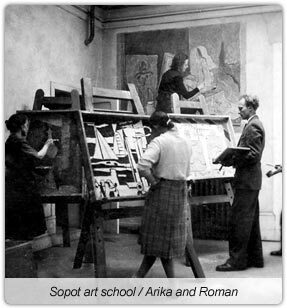 Just after the war, Arika attracted by the artistic activity, enters the National Superior School of Fine Arts in Sopot, near Gdansk, where she studies painting in the workshop of nationally renowned art professors: Artur Nacht-Samborski and Jacek Zulawski. “Studying in the Fine Art School was the best period of my life. The best years, a carefree period full of hope”. She meets her future husband Roman Poray- Madeyski, student in the mural painting section, descended from a well-of noble Krakow family. Deprived of all their property by the communist government, her relatives die in Stalin’s Siberian gulags. Specialised in fresco technique, Roman Madeyski participates in the façade restoration old buildings destroyed during the war and rebuilt as identical in the 50's: those of Gdansk, Lublin and Warsaw. After having finished studying, the couple moves in with friends, in an old manor near Warsaw, in Czerniakow. "We lived in two rooms without any sort of comfort, we had to get the water in the courtyard; but we lived a very social and festive life: all the artistic Warsaw passed by us, celebrities, people who everybody used to talk about and the snob people who were always around them: painters, graphic designers, writers, actors, film-makers. The house was full of people night and day. We also were a local curiosity: any important personality who came from abroad was immediately brought to us". 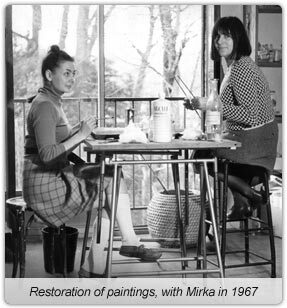 Arika Madeyska will keep her artist's name all her life, even when she divorces from Roman Madeyski, not so long after their only daughter's birth. She receives her grand prix in 1955, during an Exposition Nationale des Jeunes Artistes in the Arsenal of Warsaw, becoming a young contender of polish art. Rejecting radically the socialist realism style, she imposes her own painting language and participates in many exhibitions and solo exhibitions in artistic salons and nationally famous art galleries (Zacheta, Krzywe Kolo, Kordegarda). 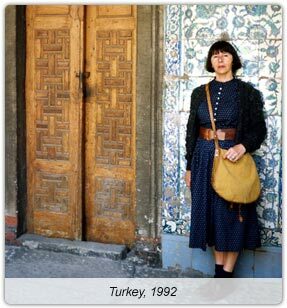 She participates every year in the Fine Art Festival in Spoto and receives a reward from the Ministry of Culture for an art work presented in the Young Painting and Sculpture exhibition in Spoto in 1957. 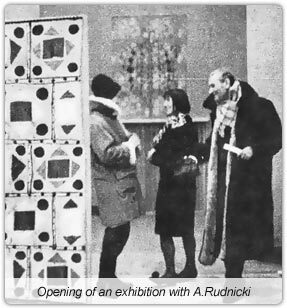 Her first solo exhibition takes place in Salon of the New Culture in Warsaw in 1959 with very favourable criticism: “the sensitive and curious inner world, the lyricism of form and colour" are praised. 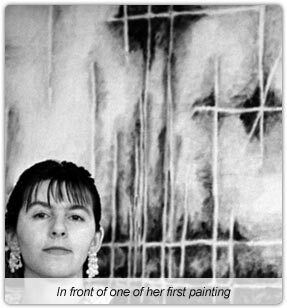 She is invited to participate in two exhibitions abroad: 12 polish painters in Paris (Galerie Charpentier) and 50 years of the polish painting in Geneva. The Benezit art gallery in Paris dedicated to her a solo exhibition in 1959 and 1960: she exhibits her still figurative canvas, tainted with surrealism and the first geometric monochrome abstractions. In the 60's, the solo exhibitions followed one another in Warsaw: in 1962, in the National Gallery Kordegarda, then in Krzywe Kolo, she presents her first collages on different supports: paper and fabric. In the same period, the Vice President of the United States, Richard Nixon, during an official visit in Poland, purchases two of her paintings, which caused quite a stir in a Stalin regime! "I worked greatly, painted constantly. I became famous enough, I was invited in every exhibition, and received rewards. My paintings were purchased by museums and by private individual. I was launched in the artistic world, it all happened very naturally, without having to make any effort”. In spite of the fame and a certain liberty of expression, tolerated by the authorities, she has to put up with the weight of repression that is harmful to her independence. "Even during the most totalitarian period in Poland one could paint like one wanted, without being forced to do socialist-realism, it was important just to have a bit of character (…) I was tired to know everybody and to be known by everybody, I needed to get away from that world; to leave was the only solution"
In 1963, in total glory, taking advantage of a grant from the State, she definitely left for Paris, city that will always fascinate her. The Lambert Gallery will exhibit her art works in the same year: "the non-figuration has given birth to Madeyska’s strange dreams (…) she creates a network of diaphanous veins that suddenly appear (…)". Her exile will be mark a rupture in her private and professional life. It won’t be just a matter of living only on her painting but the most important thing will be to lead a real "bohemian life". 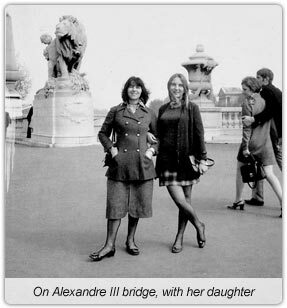 The first Parisian years turn out to be very difficult years because of a lack of financial and material means, and also because her teenage daughter comes to live with her. "Our life was difficult, very difficult, we lived moments of real misery, the kind of misery where you don't have anything to eat; we learned to live with three francs a day in our pockets". Through polish immigrant friends, like the painter Joanna Wierusz-Kowalska, she will specialise in restoration of paintings in a private workshop. She will participate, with her companions, to the reparation of the frescos in the Fontainebleau Castle. In the same time she enters in dissidence making friendship with the Kultura Literature Institute, clandestine publisher based in Maison-Laffitte, directed by the couple Zofia and Zygmunt Hertz. She is in touch with the literature sphere and intellectual dissidents: Witold Gombrowicz, Czeslaw Milosz, Marek Hlasko, Jerzy Giedroyc, Jozef Czapski. This illicit relation will be the cause of intimidation from the polish authorities. Deprived from her official identity documents, she will not be able to go back to her country for many years. Her social and cultural Parisian life is intense, she remains however very close to the Polish artistic sphere. Her Parisian flat in the 15th district will be the centre of many Franco-polish artist meetings: the graphic designer Roman Ceslewicz and Jan Lenica, the sculptors Maria Papa and Alina Szapocznikow, the painters Jan Lebenstein, Mieczyslaw Janikowski, Zofia Szalowska and Pierre Ducordeau. Some of her closest friends like Lunia Czechowska, ex companion of Modigliani, will sustain her in her difficult moments and will introduce her in Parisian galleries, she will work for them as restorer of paintings. But she will never stop painting. "It is a necessity for me, I need to paint"
Her pictorial language will be subjected to changes: her canvas will become definitely abstract: circular forms interrupted by transparent lines, delicate colour range of monochrome tonality. In the 80's she discovers New-York, city that will fascinate her greatly: she will stay there quite regularly and will exhibit many times. The travel diary in which she mixes texts and sketches will be the witness of her many visits in the United States, in southern America, in Asia and in Europe. She ties again with her country after the communist fall: thanks to the exhibition “Jestemy" in 1992 in the Zacheta national gallery in Warsaw, she will start a new artistic career in Poland. Solo exhibitions will follow one another in many galleries and museums in important polish cities. 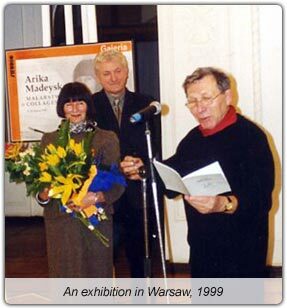 In April 2004 the exhibition in a Warsaw gallery, will be the last, as she suddenly dies in December 2004 in Paris. 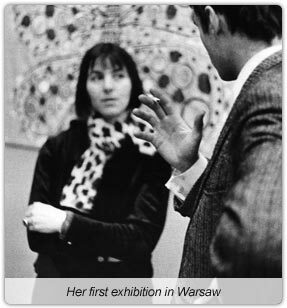 The Polish Institute in Paris will organise a posthumous exhibition few months after her death, and the Historic Museum in Sanok in Poland, will dedicate to her a retrospective in 2007.